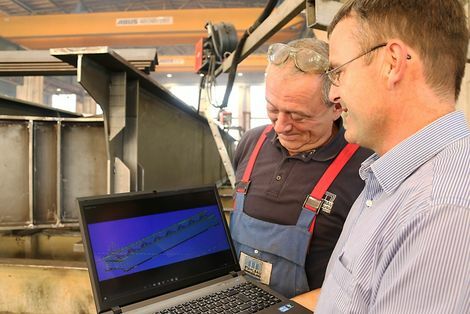 Stahlbau Magdeburg managing director Dirk Linke (r.) and fitter Jörg Pilkiewicz follow the production status of a real component on the 3D computer model. It is part of a railway bridge that will span the Leine. No steel bridge is like any other. For Stahlbau Magdeburg GmbH this means that each order is a custom product, involving an elaborate production process. This is why this company from Saxony-Anhalt is on its way into the era of Industry 4.0. Together with the Fraunhofer Institute for Factory Operation and Automation IFF and Cosmo Consult TIC GmbH as partners, this company from Saxony-Anhalt is developing new approaches for the “digital steel finisher”. Footbridges and cycle bridges, road and railway bridges, but also facilities, equipment frameworks and warehouses – Stahlbau Magdeburg GmbH based in Saxony-Anhalt’s regional capital of Magdeburg possesses more than 60 years of expertise in dealing with the metallic substance that it bears in its name. Their steel structures possess aesthetic beauty, fitting in with the surrounding landscapes as visual highlights. There is an impressive picture gallery of reference objects all over Germany. Bridge-builders are equipped with foresight; especially the Magdeburgers. The managing directors Ralf Luther and Dirk Linke attentively observed the changes occurring in the world of work. As a result of this, they were already discussing digitalised production within their company 15 years ago. “If we optimise the logistical interplay of work steps within a production process; if we reduce malfunctions and faults together with their effects, we can build up to eight more bridges a year”, says Dirk Linke. He reports on the close cooperation with the Fraunhofer Institute for Factory Operation and Automation IFF in Magdeburg. For two years, Stahlbau Magdeburg has been a partner within the initiative “Industry 4.0 – Digital Construction Site”, which is funded with resources from the EU and the federal state Saxony-Anhalt. “The aim of the research and development project is to close the gap between digital engineering and digital construction”, says Andrea Urbansky. She is a research assistant at IFF and looks after the joint project “Industry 4.0 – Digital Steel Structure Finishers”. In addition to the IFF and Stahlbau Magdeburg GmbH, the software developer Cosmo Consult TIC GmbH is the third partner in the alliance. At the Magdeburger steel finishers, planning and construction are carried out on the basis of technical expertise and craftsmanship and decades of experience. None of this will change in the digitalised future. Nevertheless, Dirk Linke knows that the production process will change greatly and summarises the vision in three letters: BIM. In BIM, relevant data is digitally recorded and processed, in order to ultimately generate a virtual computer model of the planned construction. In a few years’ time, says Dirk Linke, companies in the construction industry will only be able to react to public tenders if they have this kind of virtual model. “And because we do not have a big budget for apprenticeship premiums, we have set off into the era of Industry 4.0 in good time”, adds Ralf Luther with a wink. Both managing directors are expecting a market advantage from the high investments in their digital infrastructure. The company’s 70,000 square metre premises have now been completely digitally captured and can be accessed on the computer screen. Every tool, every machine, every part is saved and depicted in the database. “In the next step, the digital inventory, combined with digital components, allows a simulation of all movements and sequences in the production process”, says Project Manager Andrea Urbansky. “When the digital model is expanded with digital component tracing, you can see which machine the component is currently been processed upon. This allows for a quick target-actual comparison.” These innovative approaches for the generation and presentation of information are also of great use to the workforce. In-house processes and the procedures on the construction site become more transparent. The Magdeburger steel workers usually operate in two shifts. When the order situation demands it, night-shifts are added. On a digital construction site, communication about progress in production or about the state of the machines, for example, is much faster, says Dirk Linke. “In addition, components equipped with transponders could communicate with each other. If electronic recording devices like mobile telephones and tablets are integrated in the communication, warehouse workers, fitters, welders, preservers, quality control inspectors, construction supervisors and all the other on-site groups could save a lot of time”, adds the project manager. Apropos saving: qualified skilled employees would still be needed in their company, confirm the Managing Directors Ralf Luther and Dirk Linke. Furthermore, of course, even more IT specialists would have to work on a digital construction site – which was demonstrated by their recently completed bridge-building pilot project. The bridge “Baakenhafen Hamburg” is the first real joint project of three partners. The manufacturing and assembly of the bridge parts are traced by means of radio-based tracking technology – from the production hall to the construction site. A supervision system processes the information, so that the respective project status can be called in real-time by the construction manager and customers. A site information system developed by Fraunhofer IFF visualises the data. “At the same time, it is able to simulate logistics processes”, says Andrea Urbansky, describing the digital construction site of the future. “Prompt information like this is a big advantage in the construction industry”, emphasises Dirk Linke. The entrepreneur has calculated that a digitalised production process can save his company up to 30 percent in costs.